I come from a long line of game-playing families. I was one of those lucky kids, with grandparents right down the street in our quiet town. I could make a quick phone call, then jump on my bike, riding off to eat some chocolate chip cookies, sew a new doll dress, and play a game (or two, or ten) with my grandma. My other grandparents lived across town, with their bottomless container of Oreos. Across town Grammy was a game-playing grandma too. As we played games, she shared stories of how she would run down the stairs to see her game-playing grandfather who lived one floor below. Maybe game playing is one of our family’s love language, sprinkled generously with chocolate cookies. Maybe it’s part of our DNA, an excuse for that ultra-competitive streak we can’t escape. Whatever it is, it’s something I’m passing along to my children. We’ve come a long way from that Christmas with my almost-three-year-old: me, excited to initiate him into this wonderful world of games, even if it meant Candy Land on epic repeat. Him, not sure why Mom was making such a big deal out of this present he didn’t even ask for. Along the way, and a few hundred thrift shop game purchases later, we have built up quite the game stash while creating hundres of memories. Because that’s what these games are all about: creating moments of connection and memories of fun together. This is an entirely non-exhaustive list of games to start your own traditions with your younger kids. Whether they are Candy Land professionals, or gaming newbies, there is sure to be one that will light the game spark in your home! Excellent game for building the mental strength and fortitude of children and adults alike. Absolutely zero strategy; it is all about survival. Just when you think you have finally reached the end….oh no you didn’t! 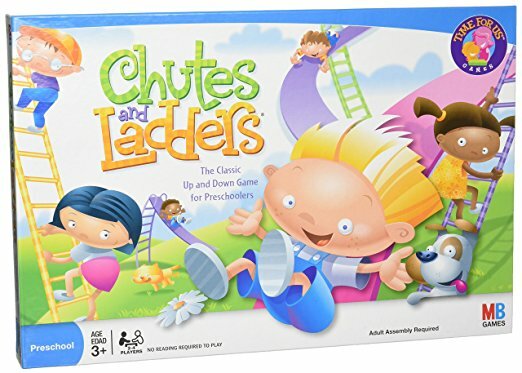 They don’t tell you in the rules (and who reads the rules for chutes and ladders? ), but you are required to slide down approximately 74.8 chutes before reaching the end. Per person. A game that requires skill other than color reading or counting to five! Pushing, screaming, jumping to early conclusions; skills readily available in the average toddler. And the average toddler caregiver. It’s simple. It’s colorful. It doesn’t have a big box to try to fit in an overstuffed game closet. Take turns rolling a die to see how many of your animals you need to stack on top of the alligator on your turn. See who can successfully stack all their animals without the animal tower tumbling down! A mixture of fairy tales and memory. Players roam the board looking under trees for fairy tale symbols, trying to remember where each symbol was so they can hurry to the castle and be the first to correctly show where the symbol on the card was located. Race to be the first player to win three cards. 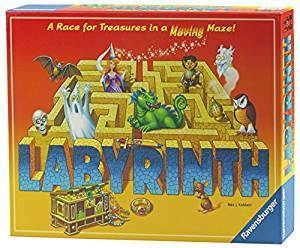 Another Ravensburger game, this also comes in a junior edition with a smaller board- as well as a Minion edition, a glow in the dark edition, an ocean edition, and more. Your goal is to shift the movable squares that make up the board and create pathways. On each turn you can shift one row of the board, trying to make a clear path to one of the treasures you need to collect. Be the first player to successfully reach all the images on your cards! For the non-chess playing parent, a painless way to introduce chess to your family. This game comes with three ways of play: either draw a card on each turn instructing you which type of piece of move, start each turn with three cards in your hand to give you options, or play a typical chess game. A fun introduction to one-player challenge games. This game comes with four different levels of challenges, beginner through advanced. Your goal is to move the cars around the board so you can successfully exit the red car. Each challenge card tells you how to set up the board with the colorful cars & trucks, all of which can only move forwards and backwards. This is a game for all ages- I still haven't cracked a few of the puzzles! Another classic that stayed classic for a reason. I played this many many times with cousins at my grandparents house, and my boys enjoy it at their grandparents house too! An introduction to cooperative games, this comes from a company with a whole assortment of “let’s win together” games. On each turn, a player draws a card, hoping the card he draws will help finish building a path to the treasure. But look out for those ogre cards! 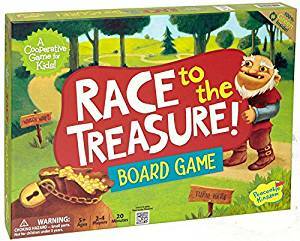 Your goal is to construct a path to the treasure while collecting the keys spread over the board, before the ogre gets there. You can make this game simpler for the littlest kids by leaving out collecting the keys. This is a game both my three year old and seven year old enjoyed= win! On each turn you spin the arrow, hoping to collect more acorns and not lose your acorns to wind or another sneaky squirrel. Try to collect an acorn of each color before anybody else. We have enjoyed many of the “Jr” games in our house- Monopoly Jr, Yahtzee Jr, Clue Jr. Clue Junior can be played with a non-reader or early-reader, as it is almost entirely picture based. On your turn, move around the board, looking under pieces to investigate who stole that last piece of chocolate cake. I don’t know which my kids like more- the actual game play, or laughing over the names of all the animals on the cards. Either way works for me, and we have played this game many times in our house! On each turn, place one of your pieces on an animal matching a card in your hand. Be the first player to make a straight line of four animals in a row. Make sure you block the other players before they beat you. Maybe you will be the lucky player who draws the wild unicorn, or the remove-a-piece dragon. I know, I couldn't help it. This has to be on the list just because. Does this even need an introduction? Wonderful for kids to learn colors, counting, and the unfairness of life. If you just don’t feel like dealing with mental breakdowns (yours or theirs), distract the toddler and hide the cupcakes and ice cream (you already do this in real life). Don’t say I didn’t warn you! Better if you place candy in the castle. Worse if the candy is only for the winner (but at some point you do have to prepare them for real life).